Although Alfred Sisley was born in France, it is curious to find among the Impressionists (the painters who were perhaps the most sensitive to the French scene) two foreigners: Camille Pissarro, a Dane from the Antilles, and Alfred Sisley. The second, it is true, was actually born in Paris – on October 30th 1839 – but of an English father, a prosperous business man. The son was to have followed in his father’s footsteps, being sent to England at the age of eighteen to learn the business, but when he showed a decided interest for painting his family gave in with a good grace and about 1862 young Alfred Sisley entered the studio of Gleyre, the Swiss painter whom chance turned into a foster-father of Impressionism. For Bazille, Monet, Renoir and Alfred Sisley all found themselves in his studio at the same time and were soon sharing the same hopes and aims. Thanks to the letters quoted by M. Gaston Poulain in his valuable book on ‘Bazille et Ses Amis’, we are fairly well acquainted with the reactions of the little group, who still kept together when Gleyre’s studio closed down before long. Monet, who always had an inclination towards proselytism, was incontestably the leading figure of the school. 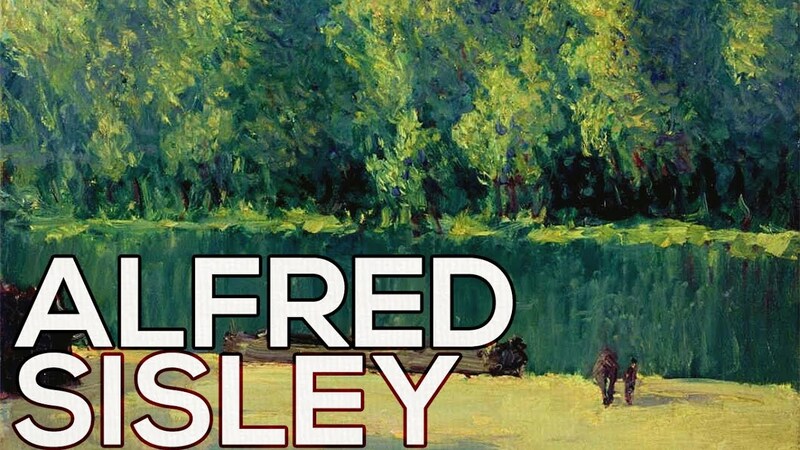 There is little mention of Alfred Sisley, who used to keep in the background: the respective positions of the two men were to remain unchanged during the whole of their lives. Though Alfred Sisley was a regular exhibitor at the Salons from 1866 to 1870, he was still looked upon by his companions as an amateur who had never felt the pinch of poverty. Nevertheless they were all on intimate terms with him; in 1867 and 1868 his friends Bazille and Renoir were both painting his portrait, Renoir twice. The most revealing and the most amusing of these portraits is the one by Renoir showing Alfred Sisley and his wife in the sentimental pose of a daguerreotype. Madame Sisley is very smart in a striped dress trimmed with flounces, while Sisley’s elegant frock-coat looks like his Sunday best. The canvas is somewhat crowded, and Sisley’s features, framed in a bushy beard, seem harsher here than in Renoir’s first portrait. The outbreak of the Franco-Prussian War brought changes everywhere, particularly to Sisley. The collapse of his father’s business turned him into a poor man, who was obliged to rely on his painting for a living. On the other side of the ledger M. Lionel Venturi has called attention to the change in popular taste of which was already becoming perceptible. It would be a gross exaggeration to say that the young painters whom we are already calling Impressionists for the sake of convenience, although actually that word had not yet been coined, were accepted by the public of 1870. But they were no longer being frowned on to the same extent. The eldest of them, Manet, had his following. In fact everything was propitious; even Zola’s famous intervention was in their favour, since it kept alive that modicum of scandalised gossip and ebullience which is essential if new talents are to achieve anything. Then, with the end of the war, it seemed as if all the ground gained had been lost. As M. Lionel Venturi rightly observes, it was not so much their audacious technique to which exception was taken but the realism of the subjects chosen by these painters of the new school. They were included in the general disapprobation felt for Courbet, the Communard who was looked upon as their leader. Strictly speaking, this ostracism should have affected only the painters from life, but in actual fact it also extended to the landscape painters. It has also been debated whether the pioneers were right to isolate themselves by no longer exhibiting at the Salon but only at the private shows which gave rise to so much scandal. Zola reproached them later for this, and he was probably right in saying it was inopportune for some of them at least. Monet was of the same opinion, persisting in his refusal to join them, however loudly they proclaimed their affinity with him. All this must be borne in mind when considering the tragic case of Alfred Sisley. This faithful disciple was to some extent a victim of friendship. Looking back on the years from 1870 to 1880, during which Sisley painted his finest pictures, we find it hard today to understand why he was never appreciated. All he did was pleasing. He reminds us everywhere of Corot, the master whom he never denied (at the 1867 Salon he presented himself as a pupil of Corot). But of a Corot with a freer touch. It is true that Alfred Sisley adopted a light coloring, but this never fettered him in the least and the general effect of all his paintings remains very fine, very delicate, very distinguished, often leaving an impression of grey. Unlike Manet, whose bellicose temperament he did not share, he never went in assiduous search of momentary and exceptional lighting effects that tended to dissolve all form. With tender poetic feeling he depicts those outskirts of Paris to which he always remained faithful, living in village after village – now part of the western suburbs – on the road to Versailles and Saint-Germain: Meudon, Saint-Cloud, Port Marly, Bougival. Limpid waters vie with limpid skies; clouds of marvellous lightness pursue their way across. In winter he loved to paint the effect of snow under a grey sky behind which one could feel the sun trying to break through. One would have expected collectors to seize the chance of acquiring Sisley’s charming little pictures whose delicacy appeals so much to those who have a feeling for painting but at the same time distrust the unconventional. But “it was Alfred Sisley who was the chief sufferer”, wrote Theodore Duret, who knew what he was talking, having been a firsthand witness of all the miseries of these painters. He published some very touching letters written by Alfred Sisley in 1878 and 1879 which show the painter not knowing where to turn as he proposes a deal which would put him completely in the power of a collector. “I’m tired of vegetating as I’ve been doing for so long now… I think I oughtn’t to cut myself off any longer. It will be a long time yet before we can do without the prestige that official exhibitions confer”. In actual fact Alfred Sisley did attempt to return to the Salon, but they would have nothing to do with him. In 1879 he moved to Moret, which he never left again, and from 1880 onwards, thanks to Durand-Ruel, he had at least the wherewithal to “vegetate”. But let us be quite clear on the point: that was very far from success. Poor Sisley was never to know success; not in his lifetime, that is to say. And when fame came to his colleagues – particularly Monet, who was reaping the benefit of his refusal to compromise – there was none for Sisley. His first recognition came from semi-official circles; when the Societe Nationale des Beaux-Arts broke away from the Artistes Francais in 1890, it invited Sisley to become a Member. And yet that was the time when his painting was more likely to alarm than in his early period. He was more under Monet’s influence than ever and was introducing brighter pigments into his pictures. This was not an improvement: the lilac he was using was inclined to become crude. The delicate balance of his pictures seemed to be shattered. Undeniably he still retained some very fine qualities, but perfection was becoming rarer: in his Loing Canal the small rosy clouds are delightfully real, but the picture as a whole lacks depth and even harmony. Similarly, in Moret Bridge in spite of the vigour put into the houses the final effect is heavy and arid. After reading Gustave Geffroy’s account of his visit nobody could doubt that with his sensitive mind Alfred Sisley suffered deeply from his fate. Living quietly with his wife and daughter, the artist was growing old without bitterness but also with few consolations. Always a stay-at-home, un-attracted by distant horizons, he scarcely ever left his solitude except to do some work in Normandy in 1894 and in England in 1881 and 1897. He was attacked by cancer in the throat and bore the pain heroically. “I have no energy left”, he was writing on December 31st 1898; he died a month later, on January 29th 1899. He could never be troubled to complete his naturalisation papers, so that he has never legally belonged to the France whose countryside was the enchantment of his life.